Design5mm has created design with easy installation! attached directly to the wall. The design can also be screwed or glued to the wall. 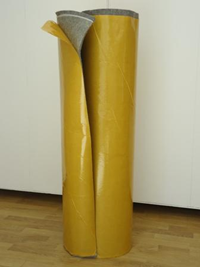 Felt screens are supplied ready to just put out on the floor. Attach a hook in the ceiling and hang up our simple acoustic mobiles. Felt design mounted with carriage bolt through the felt and attached under the desk with angle iron. Angle hinge is not visible and the screen stays put. Felt can be attached under tables, desktops and chairs for example. Cut the felt with scissors or knife to desired size, pull off the protective film and attach. Felt on the back of the cabinet can be attached with self-adhesive velcro or with glue. Contact us at info@design5mm.se if you have any questions.